We’ve all seen the movies and TV shows depicting the tarot. In this common depiction, a person walks into a musty old room for their tarot reading, and we briefly see the room’s contents: stacked with old archaic tomes on the occult and strange artefacts. The room is meant to evoke a sense of ancient mystic wisdom. An old woman dressed in exotic robes and silk scarves deals the tarot cards and methodically flips them over, and often in these depictions we see the tarot reader uncover the ominous “Death” card with a sharp intake of breath. The audience is led to believe that the recipient of the tarot reading is in grave danger. 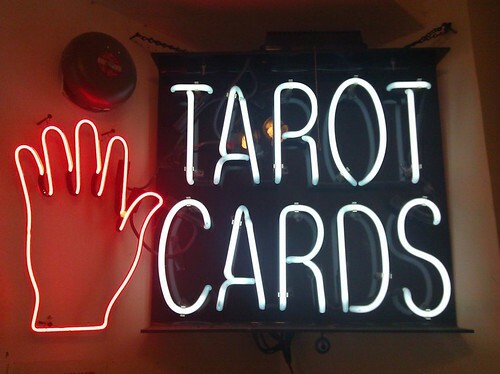 In real practice, the tarot works nothing like in its sensationalized TV and movie depictions. 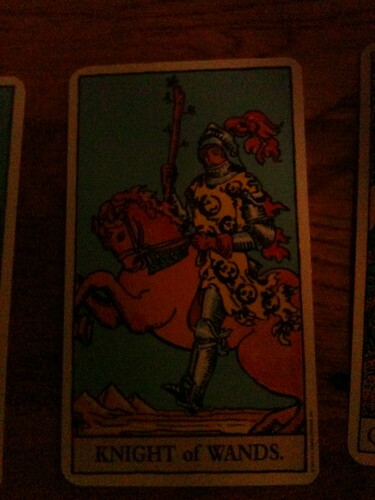 The point of tarot isn’t to warn people about foreboding events at all. The cards are designed to reflect the spiritual journey of a person’s life, with each card representing general events that commonly occur in the lives of every person. Once a reader lays out the chosen cards before someone seeking guidance—and the layout of these cards can endlessly vary—they navigate the symbolic meaning of each card as they may relate to the events and people in your life. But how exactly can someone help you make sense of your life with a deck of cards? I think a brief rundown of the tarot’s fundamental layout is in order. First, the tarot deck consists of 78 cards. Fifty six of the cards are arranged much like traditional playing cards: 4 suits (wands, swords, cups, and coins or pentacles) numbered to ten, with four royal cards at the top of each suit (king, queen, knight, and page). These 56 cards are generally referred to as the “lower arcana” of a tarot deck. Each suit stands for a certain characteristic. For instance, the wands suit generally stands for wisdom or knowledge, while the pentacle usually represents logic. The individual meaning behind every numbered card further deepens the meaning of the suited cards. For example, the “three” card holds a general meaning of union and ascension, and the culmination of energy; it’s a powerful number, but one that can mean vastly different things depending on its suit. The three of cups (a suit generally saved for emotional issues) might signal the next step of a valuable relationship, while the three of wands could mean gaining a keen insight on some issue relevant to your life. The remaining 22 cards are the “higher arcana” cards, vividly drawn and enigmatically named, which span all the major archetypal events of the human experience. The higher arcana cards exist outside the suit system, and they’re numbered in an effort to chronicle the universal journey of every person as they go through life. These are the cards you might recognize from pop culture references: the fool, the moon, the wheel of fortune, and the before mentioned death card among others. When a higher arcana card appears in a card reading, it demands special attention as its meanings are usually much deeper and foundational than those in the lower arcana. 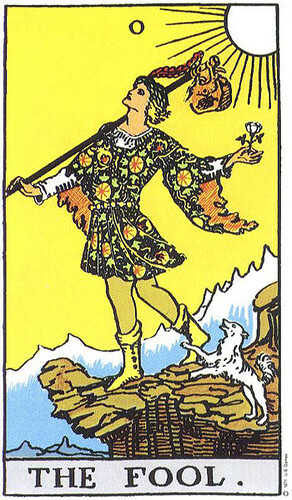 The fool card, for example, usually denotes a beginning, whether it’s the beginning of a new job or a new relation, while the hanging man usually signifies a person oscillating between life-altering choices presented to them. As we can see, even a brief explanation of the tarot’s mechanics begets a multitude of questions. It may be easy enough to understand each card individually, but what happens when 5,7, or 12 of these cards are arranged in a pattern. How do they relate to each other within the scope of a person’s life? Does the positioning of the cards matter? And so on. The complexities of the tarot are too legion to address in a single book, much less a blog post, so I won’t even try to address the questions surrounding its influence and draw. However, I will address a common misconception about the tarot, namely the belief that the tarot determines events before they occur. Tarot cards hold no innate power to explicitly divine the future. What they can do, and what they do do very well, is help lay out the potentialities of the future to the subject. A person presented with so many general life situations would find it difficult to not see a bit of their own life in the cards. The tarot reading creates a safe place for people to recognize and confront the crises and turning points in their lives as they see them, and to personally determine how best to resolve them. From this perspective, the power of the tarot card is entirely self-determined; they will only enlighten the subject if the person allows them to. And, for a centuries-old tradition, you probably won’t be surprised to learn how much of what the tarot reveals about our lives really does ring true. Well, who amongst us is an expert in the Tarot. Certainly not me. I have had one sitting at the College of Psychic Studies and strangely, given how much I admire the College I came away happy but uninspired. What’s been your experience with the Tarot? Over-rated? Under-rated? Misrepresented? Please share your opinions below.